The Sony AF8 delivers beautiful picture quality thanks to superb picture processing. Its one problem is simple: it's not as bright as the 2018 competition, which gives LG and Panasonic a foot-up in the brightness stakes. The idea behind Sony's second series of OLED TVs, the AF8, is brutally but effectively simple: they're intended to offer a cheaper and more accessible design alternative to Sony's debut A1 OLEDs (which continue to be available alongside their new siblings). The only concern is that if these are the only differences with the A1s, can the AF8s keep pace with the OLED advances being made by rival brands, such as the Panasonic FZ802 and LG C8? While it was certainly glamorous and unusual, the standless design of Sony's A1 OLED debutantes was not to everyone's liking. Particularly when it came to the way the screen angled back slightly to rest on a rear support leg. The AF8, by comparison, sits bolt upright on a centrally mounted metal plate. This design needs much less surface space than the A1 too, since there's no need to accommodate a lean-on leg angling out from the rear. The absence of this leg also means that you can wall mount the AF8, whereas the A1s could only be set on a flat surface. The AF8 does share some design touches with the A1: the frame around its screen is still remarkably trim, while there are no conventional speakers either (instead it uses rear-mounted exciters to vibrate the screen, turning it into a highly innovative stereo speaker). The AF8's OLED panel means that, unlike LCD, every pixel in its 4K-resolution screen can produce its own light source. This has a transformative effect on contrast, since it means you can have the deepest black pixel right alongside the brightest white one, with no cross-contamination or compromise at almost any viewing angle. Also hugely important to the AF8 is the X1 Extreme processor. It can upconvert standard dynamic range (SDR) to high dynamic range (HDR) better than any competitor. It's got a dual database engine for advanced upscaling of HD sources to the screen's native 4K resolution. It employs an advanced colour processor that removes colour striping from HDR sources, joining with Sony's Triluminos engine to deliver an almost infinitely subtle range of colours. And it offers the best motion processing in the TV world in the shape of Sony's MotionFlow platform. The power of Sony's processor has recently proved sufficient enough to bring onboard support for the premium Dolby Vision HDR platform, which joins support for the more standard HDR10 and HLG HDR formats. Dolby Vision, if you're not aware, carries an extra layer of scene-by-scene information (metadata) to help TVs deliver the optimum picture quality from any source that carries Dolby Vision encoding. Measuring the AF8's brightness with an HDR white window occupying 10 per cent of the screen records a figure of 700 nits in its Standard preset. This drops to below 650 nits with the AF8's more movie-focused picture presets. These are roughly the same results obtained from Sony's A1 debut OLED TVs from 2017. Which is a slight shame given that other brands are getting close to and beyond 800 nits with their 2018 OLED TVs. After all, while brightness isn't the only thing that matters for a satisfying HDR performance, it certainly helps. One final picture feature of note is the AF8's 30ms of input lag when running in its Game mode. This is a decent, if not a ground-breakingly low result that makes it harder for gamers to blame the TV for all their online deaths. Outside of the game mode, the AF8 takes a much longer 100ms to render its images. The AF8's smart features are a classic Sony mixed bag. The good stuff lies, predominantly, in the AF8's YouView app: this handily brings together content from the catch-up services of all the UK's main terrestrial broadcasters, presented in an attractive and easy-to-browse interface. Rather trickier to deal with is the Android TV system that provides the bulk of the AF8's smart services. While there's talk of a much improved interface just around the corner, for now the AF8 is stuck with the overbearing and buggy menu system that's defined Android TV since the days it first appeared. It doesn't prioritise video streaming apps sufficiently, or provide enough customisation options. The power needed to run it also seems to cause knock-on issues with the AF8's picture and sound setup menus, causing them to run extremely sluggishly at times. You do at least get the key Netflix, Amazon Video and YouTube apps on Android TV, though. It's also worth noting that the Android TV system now supports both Google Assistant voice control and direct Chromecast from external devices. Sony's X1 Extreme picture processing has always looked impressive no matter what TV it appears on. With the AF8, though, it arguably delivers its finest all-round showcase. Something about the pixel level light and colour control of this OLED screen seems tailor made for the extra colour, contrast and detail precision that the engine makes possible. Colour blends within HDR images, for instance, look exquisitely refined; completely free of the banding and noise issues that can appear in bright or subtly blended areas on lesser TVs. Intensely, immaculately deep blacks are able to sit just a pixel away from the image's brightest, most colour-rich areas without either compromising its neighbour too. There's no hint of the backlight clouding or inconsistent black levels associated with almost all LCD TVs. Sony's panel management also means that the AF8 handles transitions from full black to near black supremely well, with practically none of the fizzing noise, blocking artefacts or black level instability that can occur when working with near-black picture elements on lesser OLED TVs. Motion is handled beautifully via the Standard setting of Sony's Motion Flow processor. There's practically no judder or blur, but there are also pretty much none of the unwanted processing side-effects you get with lesser motion systems. It's seriously impressive stuff. Sony's processing chops are also gorgeously on show with the way the AF8 upscales sub-4K sources to its native 4K resolution. Detail levels are beautifully enhanced, while source noise is removed supremely well. The result is a gorgeously polished picture that holds up remarkably well even with the poorest quality source images. Also impressive is the Sony's system for converting SDR sources to HDR ones. Colours are expanded without looking forced or unbalanced, while brightness levels are gently ramped up without making bright image areas look flared. Sony is so confident about its SDR to HDR conversion, in fact, that it applies it undefeatably to most of its picture presets. There is one problem: brightness. With HDR sources, the AF8's pictures just aren't bright enough to deliver as much punch and dynamism as other 2018 OLED TVs seen to date. This limitation also means that dark HDR scenes can look short of shadow detail in places. And if you can't block out all sunlight in your viewing room then serious HDR movie viewing sessions will suffer. The AF8's limited brightness limits the volume of colour the AF8 delivers too - especially when considered against the best of the ultra-bright LCD TVs out there, such as the Samsung Q9F. It's possible that Sony has deliberately capped the AF8's brightness to deliver more detail in the brightest parts of HDR pictures, as well as, perhaps, more refinement and richness in its boldest colours. Certainly plenty of AV fans will be fully onboard with Sony's refined approach. After all, many home cinema fans will be prepared to sacrifice some brightness for Sony's precision and gorgeous black levels. Using the AF8's screen as its sound system proves a stroke of genius. It produces a remarkably large, room-filling soundstage that's clean, open, and rich in detail. Voices sound well rounded and clear, while a decent amount of bass surprises given the set's physical size. It even manages to deliver music quite well, which is practically unheard of with built-in flat TV speaker systems. The only thing that catches it out is running dense action scenes at loud volumes. This can seemingly overload the screen-vibrating system, causing the sound to become a little harsh and constrained. There are many things to love about the Sony AF8. Its new design is much less controversial than that of Sony's debut OLED TVs, while its picture quality is beautifully refined and measured thanks to Sony's superb picture processing. It even sounds very good for most of the time, despite having no visible speakers. The problem is pretty simple: other OLED panels in 2018 have introduced a potent step-up in HDR-friendly brightness. 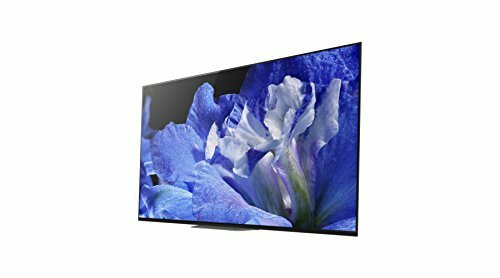 Sure, many of these competitors can't deliver the processing wonderment that Sony offers, but on the whole, while it's still a great TV, the AF8 is a whisker behind the competition in the brightness game. Despite using a potent new Alpha 9 processor, the LG C8's pictures don't handle noise and motion quite as well as the Sony 55AF8 does. It does, however, deliver much more brightness and colour volume with HDR sources, making the cutting edge new format feel more natural and satisfying. Especially if you're watching in a room that contains any ambient light. This is the OLED screen to beat. The Panasonic uses the same panel as found in the LG C8 (above), but it's actually a little more affordable. So if you're up for saving a spot of cash and don't mind Pana's simpler design aesthetic then this is another OLED panel that's tough to beat. Samsung's latest 55-inch flagship TV is a £500 more expensive than the AF8. However, it delivers much more HDR-friendly brightness (almost 2000 nits) and colour volume, while also using an innovative direct backlight system with hundreds of zones of local dimming to deliver black levels that rival those of OLED screens at times. The only catch is some lost shadow detail in very dark scenes.